it's a day i'd never thought i'd see come. two years ago we were in the thick of what seemed like would become a life-long battle with bad behavior. every.single.day was a bad day at school for the dude. i think i got 3 phone calls within the first two weeks of school. and by the end of the second month of school i thought i was going to pull my hair out. and then pull the dudes out as well. i'm not sure if it's maturity..
.....because his kindergarten teacher was horrible!! the dude has worked HARD to get green almost everyday this semester. the last two years it's been hard for him to be on green one DAY a week. we've come a looooongg way. 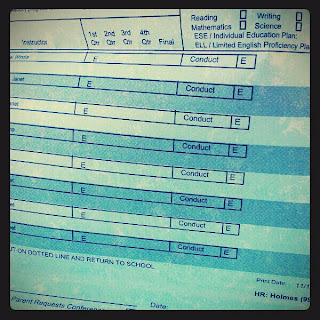 and i'd never thought we'd get here..
and as proud as i am of him for the grades..
i'm even more proud of the conduct..
because he's smart & that comes easy..
and he's had to work much harder at his behavior. 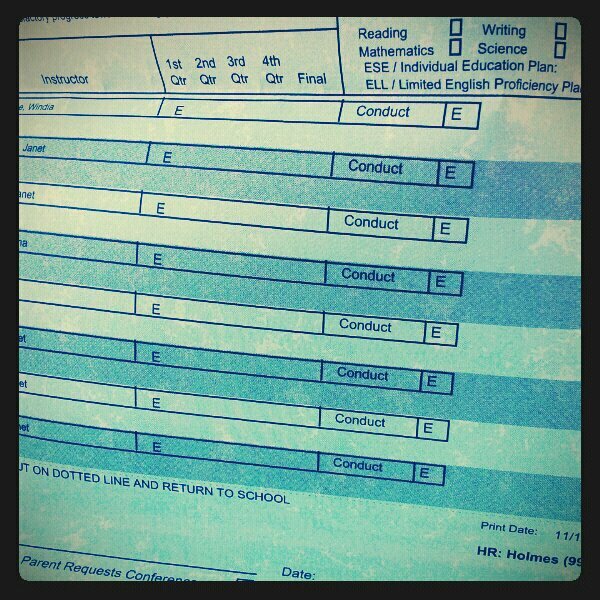 even his art & music teachers, who he's had the last two years have never given him an E before. so it's a BIG deal. and i should say.. his 'bad' behavior hasn't ever been 'bad'. always talking out of turn. getting out of his seat when he shouldn't. being a know it all, and obnoxious to boot. difficulty staying on task during group activities..
nothing that would land him in military school for sure..
so today we made a BIG deal out of it. but this time we rewarded him with a lego. which he's currently assembling in his room..
while i watch wizard of oz & fight off droopy eyelids! yay yay yay!!! nice job dude!!! i swear our kids are just as similar as we are. we've always struggled with behavior and conduct. preeeeety much the same issues as mason. and for us, it was maturity. it just gets better as they gain more self-control. but send a big congrats to him! hi-five to you guys too! oh...and love the new blog header! light and clean...awesome!